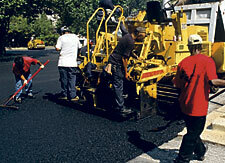 Cosmetic Repairs -- the patching of potholes or repairs of isolated surface damage. Structural Failures -- areas where the sub-base of the asphalt has failed which need to be excavated and repaired prior to laying down a new asphalt overlay or sealcoating. New asphalt overlay -- laying down of a new hot bituminous asphalt surface over an existing surface. Drainage issues -- correction of standing water problems or redirecting runoff water away from your building's foundation. ADA Compliance -- assisting you in laying out and constructing parking stalls to comply with the new 2012 ADA Guidelines. Evenings and Weekends -- where appropriate, we will schedule your work to be performed during off-hours to minimize inconvenience to your business.